The perfect wheel for Gran Turismo Sport, if not quite perfect in every respect. 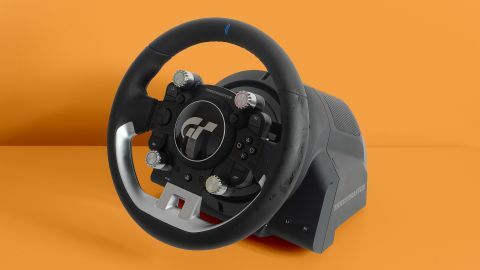 The Thrustmaster T-GT is the last stop in racing wheel tech before you end up in circles so obsessed with sim racers you’ll get in a fight for suggesting they are “just” games. It costs £699/$799, putting is well out of the reach of most of us. That is double the price of Thrustmaster’s own T300 RS GT, a package we’ve recommended countless times over the last year. The Thrustmaster T-GT the ultimate wheel for Gran Turismo Sport, with extra features just for that game. However, for sim racer fans in general it has stiff competition from the Fanatec CSL Elite. While there are significant improvements here, at the price we expect slightly better pedals and a smoother turn feel. However, you can’t argue with the quality of the Thrustmaster T-GT’s force feedback, which is excellent. The Thrustmatser T-GT comes with everything you need to get started, other than a PS4 or PC, of course. You get the wheel, the mounting gear and a board with three pedals. Those desperate for a gear stick shifter will have to buy the TH8A separately, but like every racing wheel that isn’t a cheap toy, there are high-quality clicky sport shifters integrated into the wheel. It’s a very pleasant wheel too. Unlike the Fanatec CSL Elite, the Thrustmaster T-GT has a premium stitched leather finish. The much cheaper Logitech G29 uses leather too, but this is much softer, more supple stuff that feels far better on your fingers. This is one area where the Thrustmaster T-GT clearly beats the Fanatec CSL Elite, whose default wheel has a tough but prosaic rubbery finish. We’re slightly surprised the wheel diameter is quite a small as it is, though. It’s roughly the same as the T300, about 70% of a real car’s scale, smaller than the Fanatec rival. A larger wheel naturally provides a more serious, realistic feel. And takes up more space, mind. Some of you won’t be pleased that there is some plastic on the wheel’s front too. See the silver part towards the bottom? That’s plastic, not metal. To complain too much about an aesthetic point when it’s a part of the wheel you’ll barely ever touch seems a little unreasonable. But we can understand someone spending $800 on the Thrustmaster T-GT feeling disappointed that certain parts are a little toy-like. The general look is rather smart, though, and less of an audience-divider than the Fanatec CSL Elite’s grey disco ball fascia. On the front you also get better mapping of the PS4 DualShock controller than seen in any other big-name wheel. As well as the pad’s buttons, there are two analogue sticks, where some other wheels only have a D-pad. As you can probably tell, the Thrustmaster T-GT’s main platform is PS4. It also works with PCs. Thanks to the usual compatibility clash, the wheel won’t work with any Xbox consoles. This is, as ever, a great shame, but is not something we can blame Thrustmater for when there are no true cross-platform force feedback wheels. If you’re a multi-console gamer it’s worth thinking carefully about which you’d rather get a wheel for. Do you prefer Forza or Gran Turismo? Wheels like the Thrustmaster T-GT aren’t just singular products, but accessory platforms, making the decision all the more important. You can replace the wheels part itself, for example, upgrade the pedals and add a gear shifter. $800 is a lot to spend on any gaming accessory. But you can spend more if you like. The main disappointment of the Thrustmaster T-GT is that the pedals are just decent, not the big upgrade you might expect given the price. The same board is actually similar to that sold with the Thrustmaster T300RS GT, a package that costs half the price. It’s a three-pedal board with metal footplates and a large plastic footrest. You can adjust the position of the pedals a little, and screw in an included “conical” mod for the brake that adds a progressive feel with a rubber add-on. However, in quality terms they’re actually fairly close to the pedals you get with the Logitech G29. The rival Fanatec wheel has a loadcell brake, which has a much more realistic feel. It’s much stiffer, making the brakes respond to the amount of pressure applied, not just how far the pedal is pushed down. While we find these pedals a lot more accessible (if just a touch arcadey) than loadcell sets, we hoped for more of a realism upgrade at the price. There’s just one other annoyance to the Thrustmaster T-GT, then it’s all praise until home time. The wheel base uses a belt system, like its T-series brothers. Some had hoped the T-GT would use a direct drive system, where there are no gears or belts between the motor and “steering column”. But Thrustmaster has gone with something more familiar. It’s also no huge surprise when direct drive steering wheels like the SimXperience Accuforce cost upwards of $1000 without any pedals. Using belts is fine, but the Thrustmaster T-GT also has a slightly notchy turn feel that we were hoping too see smoothed-out in the upgrade from T300RS to T-GT. Fanatec’s CSL Elite’s turning is significantly smoother. When you actually use the wheel the notchiness isn’t glaringly obvious as there are motors working against your every turn, but it does detract from the feel a little. We do still think the T-GT beats its Fanatec rival when playing Gran Turismo Sport, though, because it has additional steering column vibration feedback. This is, according to Thrustmaster, exclusive to the game, and is why the T-GT has a specific mode just for this title. You switch to it using a toggle on the wheel base. This vibration emulates the feel of different road surfaces, relaying with the wheel what, in real life, you’d feel all over your body. It adds an extra level of immersion, emulating the bumpiness of tarmac versus scrub. It also ensures there are virtually no ‘quiet moments’ when the Thrustmaster T-GT’s motors are doing nothing at all. As you’d hope, playing Gran Turismo Sport with this wheel is a completely different, and far better, experience than just using a pad. Force feedback is the star, of course, and it is really quite special. It’s more powerful than that of the T300RS, not that we think it necessarily needed to be. The cheaper wheel is already powerful enough to be borderline uncomfortable when maxed-out. The T-GT also feels more direct, more nuanced and faster-to-respond. This can be sold as a way to make your performance better, to give you a better view of what your car is doing. However, it’s immersion that improves the most. You can think of it as the equivalent to a screen resolution change if you like. A movie is not made better by being shown at 4K rather than 480p DVD quality, but the experience of watching it is still more enjoyable. A Thrustmaster T150 will indicate when your car is about to lose traction just like a T-GT, but the way this is relayed is subtler and more detailed. The feel is more convincing, more coherent, and it slots in perfectly with games that have well-programmed force feedback like Gran Turismo Sport. This is probably the most immersive wheel package you’ll get for under £1000/$1000. This is also the quietest force feedback wheel around. Geared wheels like the Logitech G29 are “mechanically” loud, while the Thrustmaster T300RS and its brothers have reasonably loud fans that kick in after a short while. The T-GT’s fans take a lot longer before they need to come on, and are much quieter when they do eventually spin. It’s not a major win if you race with headphones or a headset. But switching between the T-GT, T300RS and Logitech G29 those older wheels seem positively distracting by comparison. Once again, the immersion factor is simply better. There’s good progress to several parts of the T-GT, although those who care about a wide variety of racing games, particularly on PC, shouldn’t discount the Fanatec CSL Elite. The Thrustmaster T-GT is a great racing wheel with superb force feedback and particularly good performance with Gran Turismo Sport. It’s a little more polished in its presentation than its arch rival Fanatec CSL Elite too. However, for the real-world buyer we do wonder whether many of you might be better off with the Fanatec or the cheaper Thrustmaster options. The Thrustmaster T-GT doesn’t come with next-level pedals and its steering could be smoother considering the price. As such it seems a little expensive, if still a sensational wheel in its own right.